Our customized printed door mats and event carpets are perfect for any business or event. Whether you have an office, storefront, showroom, or upcoming event, we have the perfect mat for your needs. Fully customised to your specifications and highly durable, these mats might be perfect no matter what type of business you have or what message you want to send to your customers. Take a look at our options today to find the perfect solution for your promotional needs. Our mats are perfect for high-traffic areas and sure to be noticed by everyone who walks past them. They can be printed in full colour with your logo or message on them, or they can simply be a welcome mat in colours to match the décor in your business. Whatever you’re looking for, our mats can be customised to meet your needs. Quality Construction to Hold Up Over Time All of our mats are made from high-quality materials and are designed to last as long as possible, no matter how many people walk over them. They’re built to withstand high-traffic throughout the day, whether they’re in a store or set up at an event. The mats are printed in full-colour CMYK digital print, so colours will be bright and your message will be easy to read by everyone who sees them. 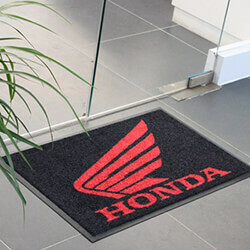 Doormats are one of the most popular options for businesses today. Our doormats are available in four standard sizes and include a nitrile grip. This makes a work safe, non-slip backing so your mat will stay in place all day long. They’re designed to be very durable and safe, even with heavy use every day. Do you have an event coming up? Capture the attention of anyone who passes by your booth with our event carpets. Starting at two square meters, these durable carpets are designed to look fantastic and can be customised with your preferred logo, imageor message so you can attract as many people as possible to your booth. Perfect for events, business offices, gyms, stores, and even factories or schools, our logo runners are available in six different widths and can be made as long as you need. The width is also customizable and your image, logo or message can be printed on the runner so everyone will see it. If you’ve got something special you need your customers to know about, check out our floor stickers. They’re perfect for any promotional event and easy to apply to your floors. They’re a fantastic way to point customers to special products you’re selling or where you have the sale products located in your store. Don’t stick with a standard welcome mat for your business. Instead, check out our options for a fully customised mat with your logo or message printed on it. We offer numerous options to make sure you can get exactly what you need and can help you customise the mat to ensure it’s just what you’re looking for.